Woohoo! I got a Wacom Bamboo Fun tablet during the holiday. But it wouldn’t install on Ubuntu Lynx. So I upgraded to Maverick. Still no luck. I found several pages of advice and instruction, none of which yielded results. So I Googled until I found the bug listings for Ubuntu (my husband got a chuckle from all of this.) Turns out all I needed to do was install Linux backport modules! Thanks to Stefan Bader for discovering the work-around. From the Ubuntu Software Centre I installed Backported input drivers for generic kernel image, the name of the file is “linux-backports-modules-input-maverick-generic“. It’s version is v2.6.35.24.28. Reboot required after installing this package. The precise name of the file may be different if you’re using Lynx, but the listed title may be close or the same. After reboot I installed Wacom’s MyPaint (also available through the Ubuntu Software Centre). The settings listed devices as ‘disabled, screen, window’, so I was confused but I made no changes. Picked up the stylus and scribbled – the tablet worked perfectly! Then opened Gimp 2.6, opened Edit/Preferences/InputDevices/ConfigureExtendedInputDevices –> The Wacom Bamboo Finger Pad, Finger Touch, Pen eraser, Pen stylus were in the devices list, marked as disabled. Again I made no changes, and the stylus worked perfectly. Last test – opened Inkscape 0.48, selected ‘Draw Free Hand Lines’ – tablet worked fine. If you were a user of Intous and think of buying Bamboo Pen then this review is for you. I had Intous3 before buying Wacom Cintiq 12 and Cintiq 21. I decided to buy Bamboo mainly for portability and the cost factor. The following are the major factors you have to think about. Although I searched Wacom to get a clear idea about the pen pressure I didn’t get any answer. After buying Bamboo I didn’t feel any difference in the pressure from any of the Wacom products I used. The tip of the pen squeaks when it contact the tablet like it does in Intous but it gives more like paper feeling. The pen doesn’t slide easily on the tablet surface. It doesn’t have an eraser like the others. The size of the pen is smaller than the one that comes with Intous and Cintiq. Personally I like everything about the pen, however, I wish it had an eraser. The buttons are customizable and have the same feeling of that in Grip Pen. It’s more slim than the Intous and the surface is really nice. When I bought Bamboo I thought it has buttons but be aware it doesn’t. The active surface has a natural paper feeling. The friction between the pen and the active surface prevents the pen from sliding fast which gives a natural feeling of real paper. The size can’t be any perfect for my hand. However, I didn’t like the fact that this tablet doesn’t have any buttons. They, to me, are very essential in the tablet. Even when compared to the early Bamboo Tablets you will find plenty of buttons?? I really don’t know why they didn’t add them. Although Bamboo lack some important features, it remains very useful for artists. It’s very portable and as simple as plug and play – only if the driver is installed-. Just bought one of these. I think it’s going to replace my Intuos 4, believe it or not. It’s Pen & multi-touch gestures in one surface. It gives me all the touchpad funtions of pinch zoom & rotate, two finger 360° scroll, and back/forward swipes that’s far more intuitive than the Intuos 4 ipod wheel. Plus all the pressure sensitive goodness when I switch to pen. At $85, it’s a perfect tablet for anyone. Works out of the box with Photoshop CS4’s pressure sensitivity, plus pinch zoom, 360 scrolling and OpenGL canvas rotation. Pen’s second button defaults to the hand tool in PS, which is very handy. Supports two finger back/forward swipes in Safari. Inkwell support too. Tablet buttons are configurable too. You can toggle Touch on and off, or disable it completely. It’s terrific for the times you occasionally need pen input (Photoshop, ZBrush, etc) or need to pack a full function tablet into your laptop bag. I highly recommend it. I bought the Wacom Bamboo Pen to aide me with my studies. I am currently a student and primarily use Microsoft OneNote to help in my notetaking. This is the most convenient for me as most of my professors utilize Microsoft PowerPoint for their lecture slides. I needed a tablet to use with my Windows 7 PC and laptop to further improve my ability to take notes and work out practice problems electronically. When it came to installation, it was plug and play for the most part. I am running Windows 7 which comes with Tablet PC components by default. 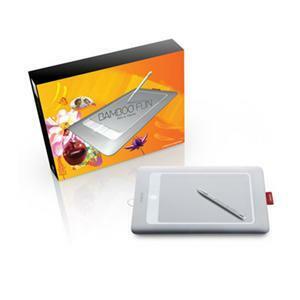 The only additional software needed was the Wacom Pen Tablet Properties software. The software allows a great deal of customization including handedness, pen vs. mouse mode, and many others. When it comes to usage, it works as expected. Utilizing a tablet can be difficult at first like learning all new things, but I started noticing my dexterity improve over time. As stated previously, I mostly use it for notetaking and working out problems and it serves its purpose well. The only gripe I have is that it is sometimes easy to accidentally hit the side buttons on the pen as they are really soft and easy to push, but I changed the way I hold the pen to compensate for that. Now as far as reliability, I have noticed the pen has started to malfunction. I bought the pen on 11/28/09 and the pen started malfunctioning on approximately 12/5/2009. After a restart, the Pen Tablet Properties software will not load at all. This makes the whole tablet completely functionless and unable to respond to taps. When I check Device and Printers in the control panel, there are no problems detected with the tablet. The only way to resolve the issue is to reinstall the driver, which is a pain because it must be done after every restart. I have posted on the Wacom EU support forums and searched for solutions but have not come up with anything satisfactoy as of yet. I am contemplating returning the Bamboo Pen before it is too late to do so and just saving up for a better (albeit more expensive) tablet. I may have found a fix to the issue. What I did was unplug the tablet, uninstall the Pen tablet properties software, and remove the tablet from ‘Devices’ in control panel. I then reinstalled the Pen tablet properties software first, and then plugged back in the tablet. It may be crucial to install the software prior to plugging in the tablet so that Windows 7 installs Wacom’s drivers instead of the ones that come preinstalled. The tablet appears to be working as it should now. I will keep Amazon informed about any new issues that may arise with the tablet.